In the end, the Nashville Predators couldn’t get close to prized prospect Jimmy Vesey. Literally. A guaranteed spot on the top two lines, a chance to skate into the Stanley Cup playoffs three weeks after stepping off the ice as a Harvard student and the benefit of burning a year off his restrictive rookie contract were not enough to lure Vesey to the Music City. It wasn’t even enough to secure a face-to-face meeting with the team that drafted him four years ago, Predators GM David Poile said. The pull to test the waters of free agency - and first graduate from America’s oldest university - were too strong. NBC's Pierre McGuire on Detroit keeping leads, Flyers hold on to 8th in East, Shane Gostisbehere and Erik Karlsson and Jimmy Vesey walking away from Nashville. Vesey’s representatives informed Poile and the Predators on Monday that their client will exercise his right to unrestricted free agency on Aug. 15, as first reported by TSN Hockey Insider Bob McKenzie. Vesey, 22, was drafted by Nashville in the third round (66th overall) in 2012. His college career ended at Harvard on Friday night. His options were to sign with Nashville now or wait until August and sign with the team of his choosing, using a loophole pioneered by Blake Wheeler in 2008, since four full years had elapsed after his draft. The hockey world is now Vesey’s oyster. And the conspiracy theories have already begun. Vesey's hometown Bruins are also believed to be a favourite. He grew up in North Reading, Mass., less than 30 minutes from TD Garden. His father played four games for the spoked-B in 1991-92, just before he was born. Bruins GM Don Sweeney starred for four years at Harvard. Most of the other 27 NHL teams will express interest in the reigning Hobey Baker Award finalist, including the perennial elite like the Blackhawks and Kings. The 6-foot-1 left winger finished his college career with 80 goals and 64 assists for 144 points in 128 games. Poile said the situation took a “complete 180” last week when Vesey’s representatives first mentioned the idea of free agency last Wednesday. Poile, assistant GM Paul Fenton and director of player personnel Scott Nichol traveled to Boston to meet with Vesey’s agents and watch what turned out to be his final NCAA game on Friday night. The Predators invited Vesey and his family to Nashville after the loss. Nichol remained in Boston. Poile and Fenton planned to return there Tuesday if Vesey lingered unsigned. The trip wasn’t necessary. Messages left for Vesey’s agents, Global Hockey Consultants, went unreturned Monday. Vesey will not gain any financial leverage elsewhere. The maximum salary on NHL entry-level contracts is $925,000, and he would have received the same maximum rookie attainable performance bonus structure ($2.85 million) with likely any team. With Nashville, though, Vesey would have been one step closer to a bigger payday. Any game played this season would have burned off the first year of his contract, leaving one year. A deal with any other team will be two full seasons starting in October. Plus, no other team can truly guarantee a playoff appearance next season. The Predators can clinch a spot this year as soon as Tuesday. 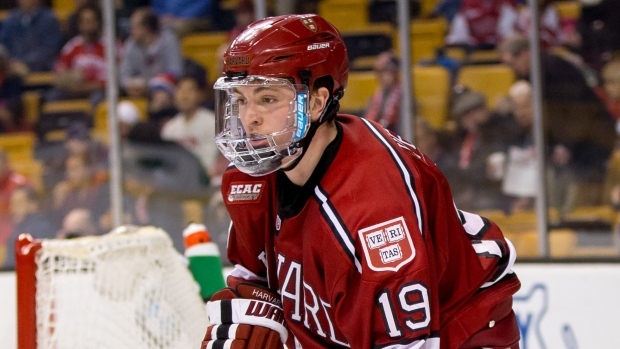 Vesey is far from the first to free himself from the shackles of the draft. Justin Schultz, Kevin Hayes and Mike Reilly are just a few of the high-profile college players to follow in Wheeler’s footsteps over the years. None will have a Harvard degree to fall back on. Some have proved to be worth the hype. Others, not so much. Former Maple Leafs GM Brian Burke blasted the agent of second-round pick Billy Sweatt after he turned down an offer in 2010 when the Leafs acquired his rights. Sweatt, now 27, went on to play just four NHL games. He is now in Europe. Vesey himself has not commented on the matter. In an essay for The Players’ Tribune last month, Vesey wrote eloquently about his tough decision last year when the Predators put on the same full-ice forecheck. Nashville tried to persuade him to leave school then, to avoid this circus. Even after Vesey cryptically mentioned his dream to be drafted by the Bruins, the Predators could not help but feel burnt on Monday. One call last week changed it all. They’re now left hoping against hope Vesey will have a sudden change of heart, as the rest of the NHL percolates on possibility.